The UK is failing to give British girls adequate education to compete against their male counterparts in science, according to new research. A new OECD (Organisation for Economic Co-operation and Development) report, which measures the performance of 15-year-olds, shows that the UK has one of the largest gender gaps in the world. The gap between UK girls’ and boys’ results in science tests is 13 – with boys scoring a mean of 521 and compared to girls’ 508. This is compared with an average gap of just one across the 67 countries that took part in the tests. The UK falls into the bottom five countries that took part in the Pisa tests – alongside Costa Rica and just above Colombia. In some countries, girls’ science results were higher than their male counterparts, providing hope for increased gender equality. Jordan, Qatar and United Arab Emirates were at the top of the rankings – with a score difference of 43, 35 and 28 respectively. In Jordan, where girls beat boys by the highest margin, boys scored an average of 388 in Jordan. Girls, however, achieved 430. Several countries achieved gender neutral results, where boys and girls scored similarly. Girls beat boys by a mean of one in Macau, Uruguay, Israel, Singapore and Germany. Czech Republic, Chinese Taipei, Tunisia and Vietnam were similarly close, with boys performing slightly better than girls – by a single point. The results have raised concerns among experts that the education system is failing to provide girls with the training and support needed for future careers in science and technology industries. Pisa has found that, in general, girls have higher expectations for their careers than boys; but on average, less than 5 per cent of girls contemplate pursuing a career in engineering and computing. In virtually all countries, the number of boys thinking of a career in computing or engineering exceeds the number of girls contemplating such a career. In some of the top-performing countries and economies, such as Hong Kong and Singapore, girls perform on a par with their male classmates in mathematics and attain higher scores than all boys in most other countries around the world. These results strongly suggest that gender gaps in school performance are not determined by innate differences in ability. A concerted effort by parents, teachers, policy makers and opinion leaders is needed if both boys and girls are to be able to realise their full potential and contribute to the economic growth and well-being of their societies. Less than one in five people enrolled on the UK’s top computer science programmes are female – and Oxford and Cambridge have fewer female computer science students than any other top university. The technology industry is disproportionate from the educational level as it fails to attract females to enroll on its key courses, data from the Higher Education Statistics Agency reveals. The UK’s top ten computer science programmes are 84.55 per cent male – with the worst performing university having nine times as many men than women. Out of the UK’s best computer science courses, University College London has the most female students. Of its 355 students, 95 are female, accounting for just over one in four graduates. 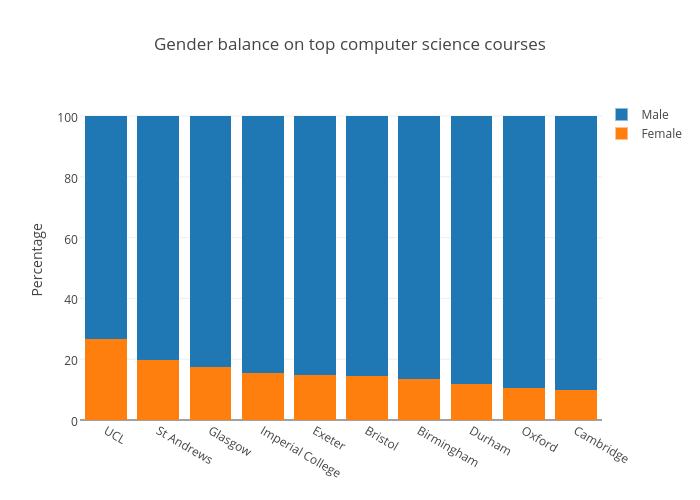 The Universities of Cambridge and Oxford are the worst for gender representation in computer science, with 10 and 10.5 per cent female students respectively. The gender disparity in the tech industry starts earlier than people might think. When looking to figures about the industry, it is not only that employers aren’t hiring women: girls are reluctant in choosing degrees in fields such as computer science and engineering. The latest figures on women’s participation in science, technology, engineering and mathematics (STEM) in the UK show that only 13% of all STEM jobs in the UK are occupied by women, according to a study by the Wise Campaign. “Technology is so much about innovation, about how you apply skills to make things better. And women’s creativity and mindset, which is focused on solving problems, are not being considered technology,” says Torie Chilcott, CEO and co-founder of Rockabox Studios. Chilcott believes that to get more women to the STEM areas it is necessary to emphasize the creative aspect of these areas. “Creativity is not being taught at schools as an skill and the STEM areas are not being presented in an appealing way. “It is necessary to stop the vertical subjects and start focusing on problem solving,” she says. Watch Chilcott, winner of the “Woman of the Year” at the everywoman in Technology Awards 2014, talking about gender gap in the tech industry.